The 4,7000 km long Coral Sea Cable System is a fibreoptic submarine cable system linking Sydney, Australia, to PNG’s Port Moresby and Honiara in Solomon Islands. Combined with the Kumul Submarine Domestic Fibre Cable Network, the system will greatly improve PNG’s global connectivity and provide opportunities for a number of local industries. Connected Pacific’s Laine Kidner says that education and health care are two sectors that ‘stand out’. Kidner tells Business Advantage PNG that health care can be provided through technologies such as video conferencing to remote areas where it is very difficult to get quality medical staff. The tourism sector is another industry that will benefit from faster internet, according to Kidner. ‘Firstly, people have to know about Papua New Guinea and I think PNG suffers because lot of the world doesn’t know what they are or who they are or where they are. ‘To promote the country as a tourism destination, it is critical to have high speed internet—not only for brand awareness out into the global market, but also when visitors come in, whether holiday makers or business tourists. ‘Everyone in the Western world expects high speed internet; it is just a given in most countries. ‘It is generally one of the first things people do when they get into hotel rooms is connect to the Wi-Fi to upload photos to Facebook or Twitter or Instagram. Security firms can also be beneficiaries of faster and cheaper internet. Kidner, who was behind last week’s Connected PNG Technology Summit in Port Moresby, says the new cable will allow better use of CCTV cameras, technologies such as swipe cards and intra-firm communications. The agriculture sector, one of PNG’s most important industries, can also benefit. ‘E-commerce is a huge opportunity, particularly for the agricultural market for PNG. Things like vegetables, fruit, coffee producers in the regions. ‘If you are known to the world—where you are as a country, who you are as a country and the quality that you can produce—people want it. ‘But if they can’t get access to it, they are not going to buy it. ‘When the new connectivity is out to the regions, and people have secure power, the e-commerce platforms are very easy to use, although it will be new. Kidner acknowledges that barriers will have to be overcome if the possibilities are to be explored. One difficulty is overcoming remoteness. 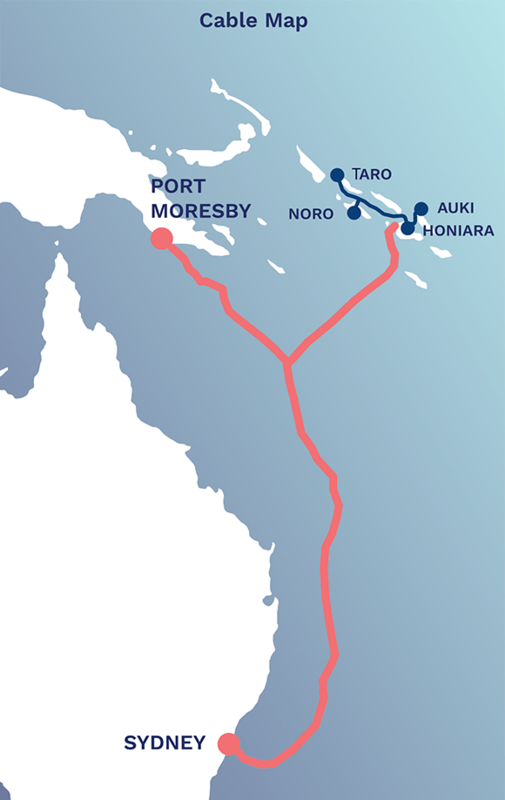 ‘It is very easy to get it to the main capitals, particularly Port Moresby, where the initial cable will come in. ‘Fibre cable is a physical product, however, so you have got to physically run a cable to those different locations. ‘Much of PNG is very remote, very mountainous and they do have environmental challenges like earthquakes. Another problem is the unreliability of power, which Kidner says is making PNG businesses hesitant to use the Cloud. ‘To get the Cloud to work you do need the pillars of your business [to be in place]. ‘One of them is connectivity—you need to be able to connect to the application you are trying to use, such as Dropbox. ‘The second problem with PNG is power. You can’t have communications without power. ‘For Cloud adoption you need both to be very available and very secure. Kinder is optimistic that there will be rapid adoption of new solutions when the cable is put in later this year.